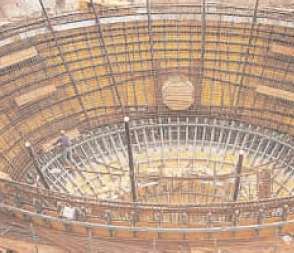 Floating concrete structures in plate shape of a fairly big diameter (about 70m ) have been performed already. It is quite obvious that the structure when done in industrial size can be built with traditional methods of concrete casting. The key question how much freeboard you need for a structure that features no deck is pretty much answered by container ships that don't feature decks either. (Around 15m). What would set the "plate seastead" apart from other seastead models is that it would only feature a "rudimentary deck" so it would be open to get "filled up" by extreme waves. The advantage is in the low cost per squaremeter as the "living space enclosure" is only partial. In general this building method opens the possibilty of creating living space at a cost per squaremeter o 1/6 th of a "fully enclosed living space" as it is created in a Building and a Shell. A further advantage is that living on a plate seastead would be like "in open air" with a blue sky over you - comparable to "living in a valley" where the seawall around the plate would be like hills enclosing a valley. 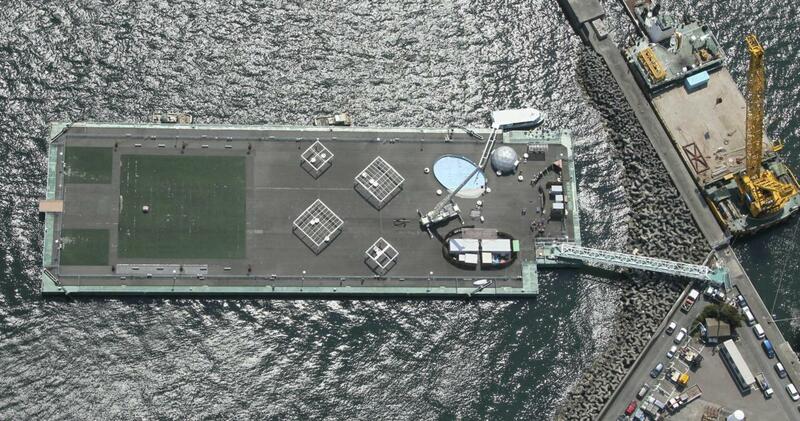 So a really big plate seastead would offer a living space that is no different to land living space at all. Small plate seasteads of stadion size would be better off if featuring a bow for wave handling in the sense of a ramform seastead, and maintain a certain grade of mobility. What we tested in our R&D site in cartagena is how small could you actually go for building a plate float. The answer is in the first picture that features a plate made of special fiber concrete. A family house sized plate (picture 2) is in the range of possibilities but must feature a deck as a 15m freeboard is not achieveable for small structures. The plate is a great way to build city sized low wind profile structures that have low requirement for locomotion and station keeping. In therory a whole country on a plate seastead does already exist - the netherlands - most of the terrain is actually under the waterline protected by a dyke (seawall) that avoid a "filling of the plate depression"... floating cities and countries based on the floating plate priciple are not so "utopic" after all. A plate shape sacrifices mobility almost completly - would not shapes that allow a certain mobility be a better starting point? The last time we checked, water occupied around 71 percent of our precious Earth’s surface. And with the serious instigations of global warming, it is clearly beginning to dawn on some of us that we are running out of ‘ground’ for our mega-cities, grand settlements and expansive conurbations. 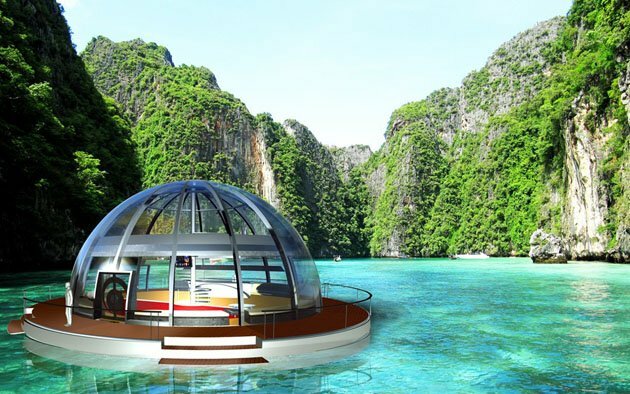 But before we press our panic buttons, there has been progressive yet credible proposals to design and build human habitats in the seas itself! 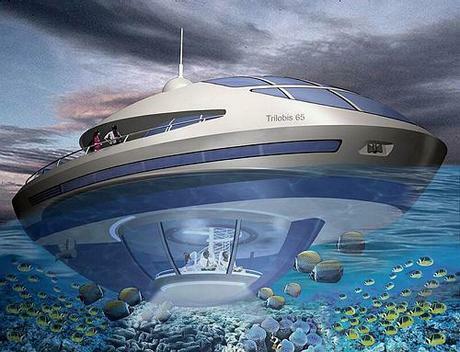 Surely the “Bioshock” fans can somewhat identify with this, but its high time we typical folk familiarize ourselves with the 10 most amazing albeit convincing concepts of floating cities – to be built in the seas. 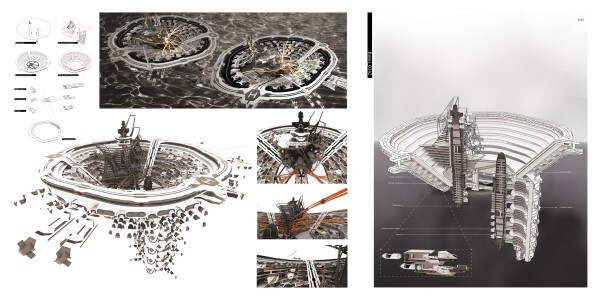 One of the winners at Sea Change 2030 + competition, this radically conceived man-made refuge known as the Embassy of Drowned Nations, in Fort Denison, Australia, is specifically designed for people who have lost their homes to rising sea levels. But it not all about the ‘poetic justice’; this innovative conception also incorporates the inverted design which causes it to sink deeper into the harbor when the water level rises, while at the same time exposing new land in the center of the refuge. The Ekofisk Concrete storage Tank a model for a seastead. 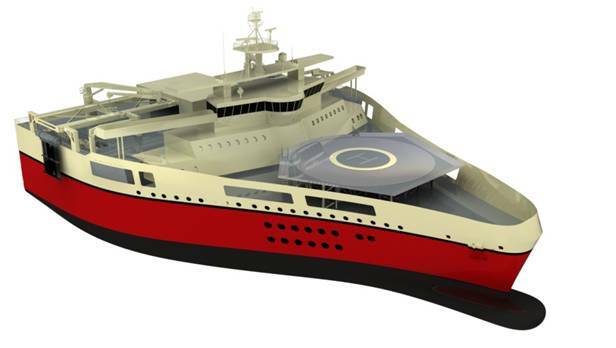 The Ekofisk Tank model gives also a good idea how you would cluster seasteads in close proximity and use gangway type connections to cross over in severe weather conditions like the north sea is presenting. 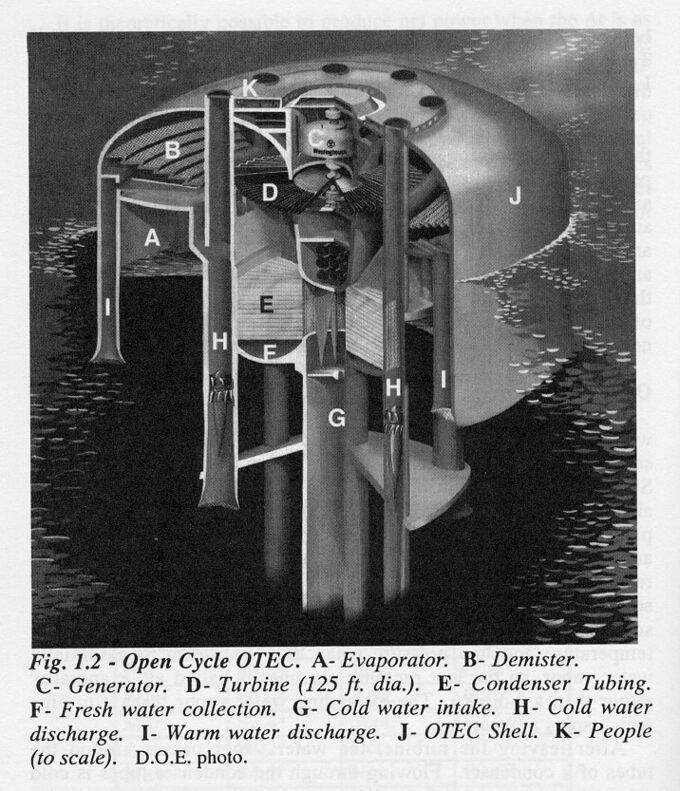 The breakwater ring of the Ekofisk Tank is an early example how you would use concrete in honeycomb structure configuration to get something that is strong, light, can take wave impacts. Instead of massive concrete walls that are expensive, heavy, and do not let pass light, a combination of truss and holes give you the freedom to design "strenght" where needed and "openess and light" where wanted. 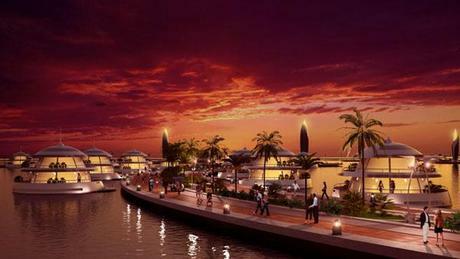 The oceanic concrete sphere would be the endpoint of this development. A maxumum of space enclosed with a minimum of material in the strongest possible way. The plate seastead could be understood as a minimalistic part segment of a sphere sparing the upper 2 thirds of the enclosure that becomes innecessary when the seastead is big enough that "no ocean wave" including the Draupner Wave can reach this upper 2 thirds of the structure. 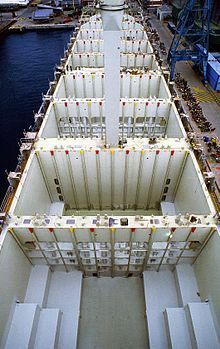 Small versions of a seastead will need this upper 2 thirds of the enclosure in the same way as bulk freighters need the Mc Gregor hatches over the cargo holds when a "wave overwash" comes in. 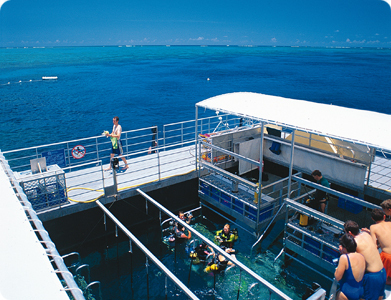 In short floating platforms are ok in a protected bay where wave impact and overwash will not happen. But when you really go oceanic and Draupner impacts need to be a integrated part of the concept, concrete shells are required as building method of choice. 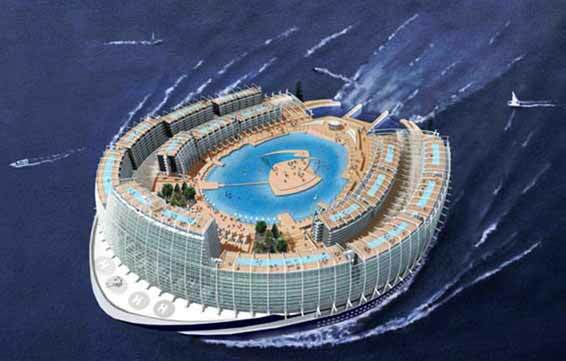 Big plate seasteads which have more or less the size of a football stadion will be oriented to the inside (like a football stadion is oriented to the playfield) the seaview on the high seas is boring this is why cruiseships already follow that principe. 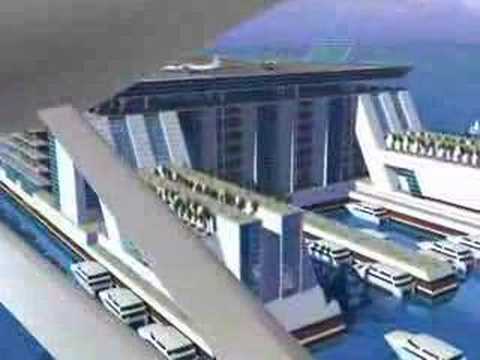 This allows the application of a windowless outer seawall that is the principal defense of the plate against the ocean. A wall height (freeboard) of some 15 m should be acceptable. 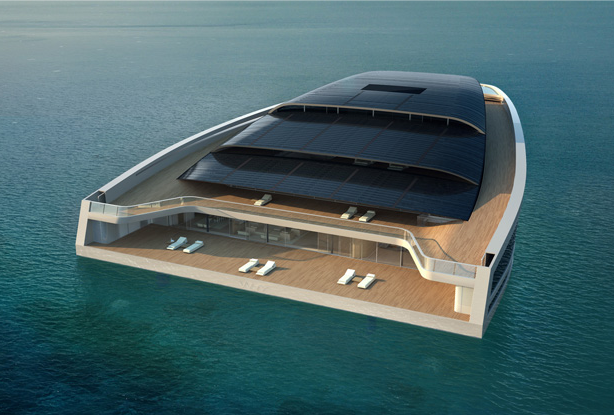 It would be a similar concept to a container ship. Like the containership the plate seastead would NOT feature a deck to protect against flooding in the case of a wave overwash. The only defense against flooding is the (enourmous) height of the freeboard (15m). 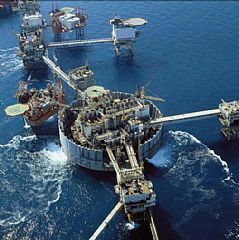 We can consider "putting a deckless plate structure on open ocean" a proved engineering concept that has been tested out already by container ships. To get a better mobility the plate shape could be modified to a triangular form similar to the Ramform. This flat triangular shape was already used for oceanic survey ships and stationary concepts like the Ramform Banf. But it has also be proposed for yacht concepts like the WHY yacht - to create a very stable wide hull that still can run at a reasonable speed. Futuristic honeycomb / plate structure / the combination of hollow honeycomb light shell and glass / acrylics surfaces allow for lightweight, daylight friendly structures that can still take the impact of a oceanic "tail event" like the Draupner wave. 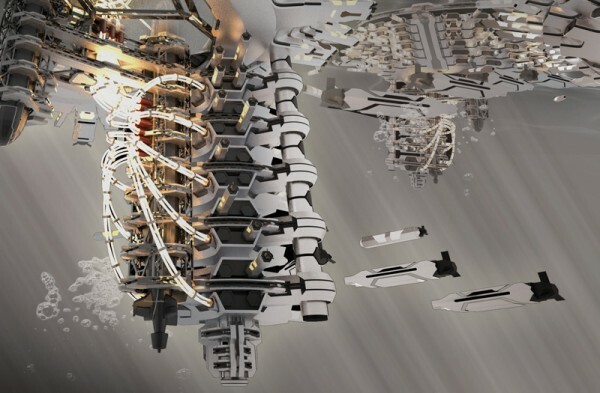 In this "artist phantasy model" the woven hollow concrete beam honeycomb truss structure shell allows for a extrem high structural strenght that outranks any ship as it is in service today. There are big window areas but those big windows are reinforced with additional truss structure from the inside so in case of a wave impact the damage is moderate and stays localized. Plate seastead type "floating lagoon" allows the come together of all kind of ships, houseboats, and floating concept under the business model of a oceanic harbor. 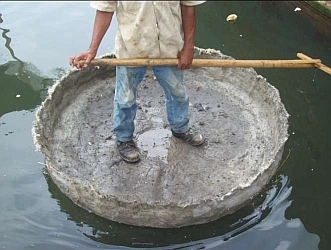 London flooding, a big concrete tank was ripped out of its foundations by the buoyancy forces and started a life as "floating concrete cell" involuntaryly. 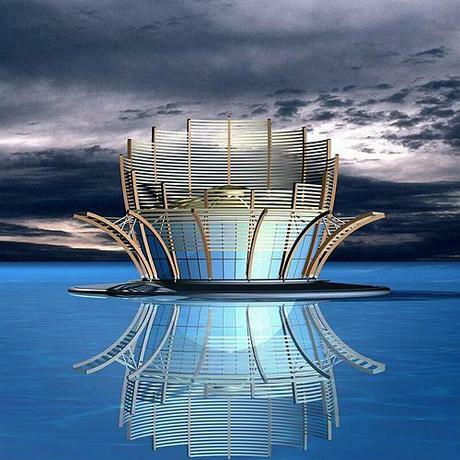 Floating honeycomb and shell structures take the principle and convert it to a "base technology" for floating oceanic cities. 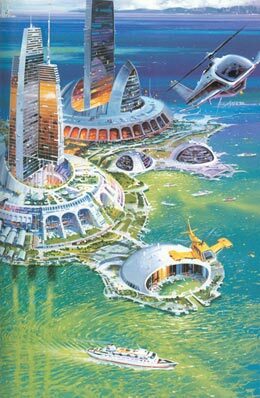 With a population growth of 1 billion per decade and landspace in short supply - coastal cities have no other option than "look out to the ocean" and start floating developments. 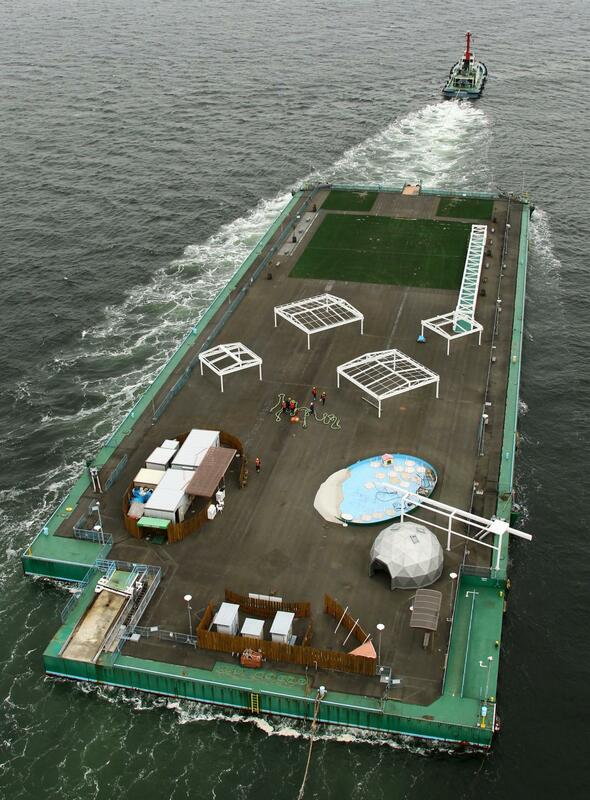 Flat float structure used to bring resources to japans disaster zone. The building of the Rion Antirion Pylon points the way how floating honeycomb shells in concrete technology will be built. The construction site is pretty much a normal concrete structure building site where concrete casting on large scale is going on using all the tools and techniques that are normally used on a land building site. The only difference, the mix trucks come in by barge. A extreme form of the plate or stadion seastead is the depth scraper seastead - which is a kind of inverse skyscraper. The idea is present quite a while - but why build a tubular tower structure when a shallow stadion like plate would have much more light and would be probably much more economic to build. 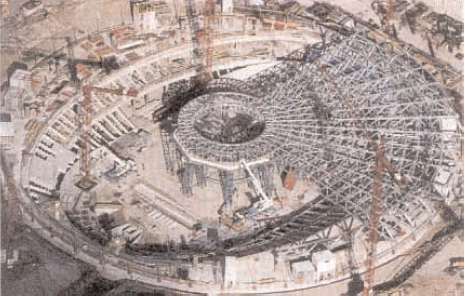 Anyhow the technology is there - 350 m deep tubular concret structures are in use as we speak (Troll A). So can be considerd "of the shelf engineering" - a variation of the depth scraper is the "Sea Orbiter". Plate seastead built in teraces like a stadion. The absence of gravity allows for a bolder architecture than land buildings can have. Other than the tower structures suggested (depthscraper, sea orbiter) the stadion form allows a lot of natural light from above in the teraces. Rion Antirion Bridge Pylon of the shelf marine floating concrete engineering.